This is one of Robin Williams' most famous quotes and it sums up his work perfectly. He made the world laugh in so many ways, on so many days and in any circumstance. His mission seemed to be to help everyone in the world to hold on to that 'little spark of madness'. His spark left us with so many wonderful movies and memories that became part of our lives. He has inspired, motivated and left people rolling on the floor. Robin Williams' life was not always easy and he struggled with things as we all do. What is remarkable and awe-inspiring is that despite all this, he just wanted to make people laugh and see them happy. His energy on stage when doing stand-up was amazing. The heart and conviction he put into all his movie roles will forever be remembered. Whether you remember the Genie or the English teacher or the crazy radio guy, Robin Williams left a mark on all of us. His words and characters will stay with us throughout our lives. I will turn to movies like Aladdin, Mrs Doubtfire and Night at the Museum when I need to laugh. I will turn to Dead Poets Society, Goodmorning, Vietnam and Patch Adams for inspiration. And if I am really having a bad day, I will find him doing stand-up comedy and giving it his all. 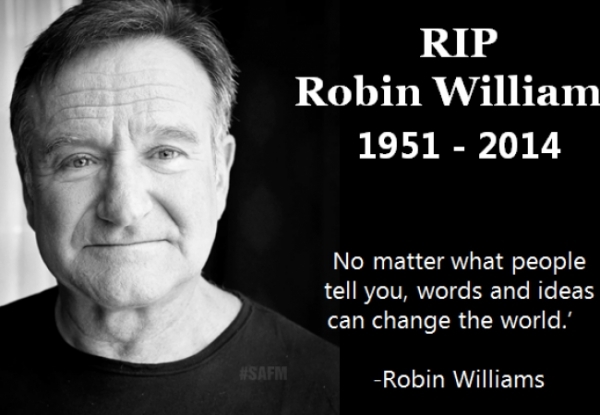 I did not know Robin Williams, but he has left a legacy for the world. A legacy that will live on and that will bring generations to come laughter, tears and inspiration. He has made many of my days better by doing what he did and being who he was.